In the parlance of my Arkansas relatives, it’s time for Memphis in May to fish or cut bait. After 18 months of meetings to make sure the design of Tom Lee Park suits the festival’s needs, the seminal question today is whether it is willing to kill off the spectacular reimagination of this mundane, mediocre place that is a park in name only. A few weeks ago, we were told that there were no major hurdles left in resolving Memphis in May’s few last issues. And yet, today, it’s taking on the feeling that if ten things are handled for our favorite regional festival, they may always have a couple more. We were encouraged by Memphis in May’s statement just a few weeks ago that it was “confident” that a solution could be reached. And yet, we’re told by a frustrated festival official that there is little reason that an agreement hasn’t already been reached: first, because some issues resulted from its architect misreading the park’s plans, and second, because there’s nothing to prevent Memphis in May from being successful in the park. We pointed out in a previous post that based on the customary square footage used by music festivals, the three large areas set aside for Memphis in May at Tom Lee Park will handle the largest attendance of the Beale Street Music Festival. When it became apparent that there is general consensus about this fact, the loud grievances by barbecue team participants came to dominate the latest wave of often hysterical complaints. Memphis in May officials say they are doing nothing to fan these flames, but it’s hard to see that they are doing anything to extinguish them either. These complaints are especially ironic, considering the fact that when the World Championship Barbecue Cooking Contest moved to Tiger Lane at the Fairgrounds because of the flooding from the Mississippi River in 2011, the feedback from the barbecue teams was overwhelmingly positive. 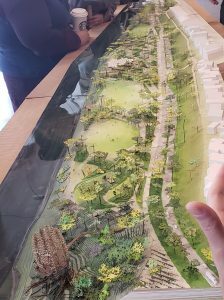 Here’s the thing: we would not support a design for a spectacular Tom Lee Park if it would diminish Memphis in May’s two signature events. However, it is simply logical that eight days of those events should not drive the other 357 days of the year. It is equally logical that the about 6% of Shelby Countians who pay to attend Memphis in May events each year should not block the 100% of local residents who could experience a grand park free for the rest of the year. Already the Memphis River Park Partnership has been contacted by promoters who are interested in scheduling large-scale concerts in the park. After all, some of the best music festivals and barbecue contests in the country are in “real” parks, and I am optimistic enough, as the longest serving executive committee member in Memphis in May’s history, to believe that its unique expertise and professional experience mean that it can leverage Tom Lee Park’s improved environment to catapult it onto the national lists of best music festivals and barbecue contests. But the design of Tom Lee Park is more than about the best use of the most prized 30 acres in Memphis. It’s also about what produces the biggest economic boost for downtown and its adjacent north and south Memphis neighborhoods. Based on our confidence in Memphis in May’s abilities and the compromises made to Tom Lee Park’s designs to accommodate the festival, there is no reason to think that its economic impact will be lessened or that it will produce less in sales taxes for City of Memphis and State of Tennessee. However, a new riverfront generates both sales taxes and property taxes and leads to increased valuation of downtown properties. Since 2011, property tax revenues and assessed values downtown have declined 4% and the downtown vacancy rate has grown by 365,000 square feet. The riverfront plan reverses that trend line, and dynamic riverfront investments across the U.S. are proof positive of that fact. In this way, the choice is not between a successful Memphis in May and a vibrant Tom Lee Park because it’s clear there is no conflict. Rather, the choice is between an underperforming 30 acres and a spectacular park that sparks new residential, office, and retail development. Best of all, the park stimulates development that results in more property taxes to support the vital services of local government and schools, whereas three-fourths of sales taxes go to state government. To repeat, the festival produces sales taxes and that’s significant, but a rebooted riverfront produces both sales taxes and property taxes. We are certain that Memphis in May is not interested in killing off a project that has such multi-faceted impact, but it’s time for it to say that once and for all and that it is a full partner and an honest broker in these discussions so Memphis can move ahead with the rebirth of Tom Lee Park. In only two months, the City of Memphis will celebrate the 200th anniversary of its official founding, and because of it, there is broad discussion about what Memphis will be in its third century. The future of Tom Lee Park will telegraph the answer. Today, it is not as much about momentum as moroseness. It’s not as much about tenacity as timidity. It’s not as much about ambition as apathy.